Anton Črnugelj studied guitar at the Academy of Music in Ljubljana, first with Andrej Grafenauer and later with Tomaž Rajterič. During his studies he had lessons with renowned teachers, such as István Römer, Jordi Codina, Konrad Ragossnig, David Russell and Costas Cotsiolis. As a soloist or a member of various chamber ensembles, he has performed home and abroad: in Austria, Croatia, Italy, Switzerland, Germany, Hungary, Greece and the Netherlands. Already as a student, he was engaged in teaching at different music schools. Additionally, he graduated in electrotechnology from the Faculty of Electrical Engineering and Computer Science in Ljubljana. 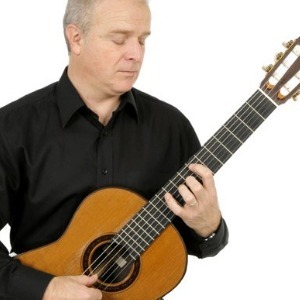 He has been teaching guitar at the Music School of Črnomelj, the Franc Šturm’s Music School, the Music School of Vrhnika and at the Conservatory of Music and Ballet in Ljubljana. His pupils have performed publicly with great success, giving concerts at music schools around Slovenia, recording radio and television shows and for the archive of the Slovenian national radio, as well as attending international festivals and national and international competitions, where they have received over 50 prizes. Anton Črnugelj is the first Slovenian guitar teacher whose pupils have successfully attended the most highly acclaimed competitions in Germany and Austria. In the international competitions in Vienna, Weimar, Velbert, Kutná Hora, Genoa, Gorizia, Belgrade, Zagreb and Ljubljana, his pupils have received 36 prizes in different categories – in most of the competitions one of his pupils received at least one first prize. His success in competitions has significantly contributed to the recognition of Slovenian guitar scene in Europe. For his contributions he has been awarded the Škerjanc Diploma for Outstanding Achievements in the Field of Music Education, the highest award given by the Conservatory of Music and Ballet in Ljubljana. Anton Črnugelj has published different articles in music magazines and has organized guest lectures of renowned teachers in Slovenia. Besides that, he is a member of juries in regional, national and international competitions, as well as a technical advisor for the national competition for young musicians TEMSIG.